AED will comprehensively guide the user through CPR (30 compressions followed by 2 breaths for 2 minutes). 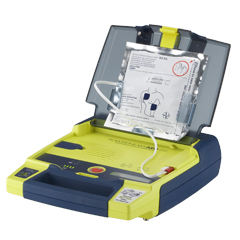 Medical Developments International also have a semi-automatic version (9390E) as well as AED’s with an ECG screen (9300P). The MDI range of AED’s are maintenance free as they perform automatic comprehensive self-testing of all critical components daily, weekly and monthly.